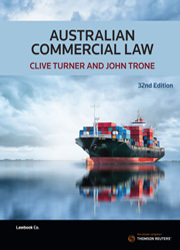 Each chapter in this 32nd edition of Australian Commercial Law has been updated to incorporate legislative and case law developments since the last edition. Extensive rewriting has been undertaken to enhance the readability of the text. Significant changes in this new edition include: A new summary at the end of each chapter. A new chapter on Personal Property (Ch 14). Two significant High Court contract decisions, Simic v New South Wales Land and Housing Corp (2016) (on rectification) and Thorne v Kennedy (2017) (on undue influence and unconscionability), are discussed in Consent of Parties (Ch 7). Competition Law (Ch 18) incorporates the Competition and Consumer Amendment (Competition Policy Review) Act 2017 (Cth), which has introduced the concept of concerted practices and removed the prohibitions of exclusionary provisions and anti-competitive disclosures of information from the legislation. The Competition and Consumer Amendment (Misuse of Market Power) Act 2017 (Cth) has repealed and replaced the prohibition of misuse of market power. This chapter also discusses two new High Court decisions: Air New Zealand Ltd v Australian Competition and Consumer Commission (2017) (dealing with the concept of a â€œmarket in Australiaâ€) and Australian Competition and Consumer Commission v Flight Centre Travel Group Ltd (2016) (concerning identification of the relevant market). Cheques (Ch 24) outlines the new Banking Code of Practice, which will come into effect on 1 July 2019. Torts (Ch 28) includes the recent High Court decision in Trkulja v Google LLC (2018) (on defamation). Intellectual Property (Ch 31) considers the new provisions facilitating the parallel importation of genuine trade marked goods, introduced by the Intellectual Property Laws Amendment (Productivity Commission Response Part 1 and Other Measures Act) 2018 (Cth). Bankruptcy (Ch 32) incorporates the amendments made by the Bankruptcy Amendment (Debt Agreement Reform) Act 2018 (Cth). Employment Law (Ch 34) includes the High Court decision in Regional Express Holdings Ltd v Australian Federation of Airline Pilots (2017), confirming the right of unions to sue for contraventions of the Fair Work Act 2009 (Cth) on behalf of employees who are not members of the union but are eligible for membership.